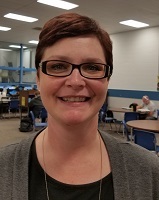 English instructor Amy Doty was named “Teacher of the Year” at the Nebraska Developmental Education Consortium in Norfolk. Doty has taught English at Southeast Community College for almost two years. Prior to SCC, she taught at Metro and Central community colleges. Nominees for this award are from the six community colleges in Nebraska and are selected by administrators. Doty was chosen for her contributions to student success and professional development. She helped lead the design of an accelerated pathway for students to complete English requirements. She also co-created a professional development resource for colleagues to learn and engage in best teaching practices. The NDEC consists of English teachers and learning support staff who collaborate to improve two-year college student success. It started in 2015.